Find the Dragon Balls! Look out for them all! note This is barely half of the recurring characters. "Our story begins, as many stories often do, with a young girl shooting a little boy in the face." — Perfect Cell, Dragon Ball Z Abridged note And no, this is not an abridged parody joke. That's really how this whole franchise started! Dragon Ball began as a 1984-1995 manga series written by Akira Toriyama, after concluding his previous mega-hit manga Dr. Slump, and spawned a franchise that would become a global phenomenon.. Dragon Ball chronicles the adventures of a cheerful monkey boy named Son Goku, in a story that was initially inspired by the Chinese tale Journey to the West (the character Son Goku was inspired by and directly named after Sun Wukong, in turn inspired by Hanuman). The manga was soon adapted into two popular anime series, Dragon Ball and Dragon Ball Z. It also received two anime sequels, Dragon Ball GT and Dragon Ball Super, the latter also having it's own manga as well and considered in continuity with the Dragon Ball manga due to Toriyama's involvement with the story development. 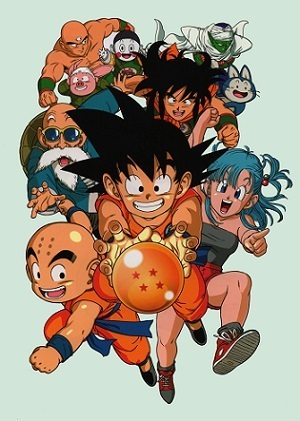 In the first half of the Dragon Ball manga (which served as the source material for the Dragon Ball anime), Goku and a huge cast of friends and enemies search for the magical Dragon Balls that they could use to make a wish come true, and encounter many characters and adventures along the way. In between Dragon Ball hunts, Goku and his martial arts-inclined friends train and compete in the periodic "Tenkaichi Budokai" tournament (known as the World Martial Arts Tournament in the West). The "boyhood" portion of the manga is generally broken down into the following story arcs (not counting filler from the anime): Emperor Pilaf, the 21st Tenkaichi Budokai, the Red Ribbon Army, Uranai Baba, the 22nd Tenkaichi Budokai (Tenshinhan), Demon King Piccolo, and the 23rd Tenkaichi Budokai (Piccolo Jr). After defeating these major threats to the world, Goku, now a young adult, finally wins the tournament on his third attempt and goes off to get married. The filler arcs present in the anime add extra adventures after the conclusion of most arcs. The original anime series also spawned four theatrical films in Japan, all of which are fast-paced retellings of the first four Story Arcs that, while honoring the manga and anime, are completely unafraid to tell them in their own way. The first three movies produced in the late 80s, Curse of the Blood Rubies, Sleeping Princess in Devil's Castle, and Mystical Adventure, form their own trilogy due to how one leads naturally into the next. The fourth film, The Path To Power, was released during the production of Dragon Ball GT as part of the franchise's tenth anniversary in 1996. While none of the Japanese movies ever covered anything related to Piccolo, a fifth movie produced in the US, Dragon Ball Evolution, did. The second half of the manga depicts Goku as an adult as he learns what he truly is, avenges the destruction of his race, meets even more friends and rivals, is joined by the offspring of him and his rivals, and continues his quest to become ever-stronger and engage in challenging battles (and saving the world along the way). The story was written entirely in a single run and is called Dragon Ball throughout in its native Japan, with the Dragon Ball Z anime debuting the week after the Dragon Ball anime without missing a beat. In the West meanwhile, the latter half of the manga was published as Dragon Ball Z, because the anime of the same got its critical exposure there before the earlier half of the story. Even the collected volumes are adjusted in the West so that the first Z manga issue starts with Raditz's arrival, rather than finishing off the 23rd Tenkaichi Budokai like in Japan. The arcs covered by the Z portion of the manga (not counting filler from the anime) include: the Saiyans, Namek, Android, Cell and Majin Buu, as well as a Trunks: The Story chapter that covers Trunk's backstory in more detail. The latter half of the Namek arc is often divided into a separate Frieza Arc, due to how long the climactic battle with the titular Arc Villain takes. After the defeat of Majin Buu, seven years pass and Goku meets Buu's reincarnation, a boy named Uub. Goku departs with him in the hopes of training him into a great fighter. For more on that part of the series, visit the Dragon Ball Z page. Since the conclusion of the manga in 1995, Toriyama has produced three stories related to Dragon Ball: the self-parody Neko Majin Z in 2005, Jaco the Galactic Patrolman in 2013, and a one-shot contained in the collected volumes of the previous listing called Dragon Ball Minus that shows Toriyama's take on Goku's father, Bardock. Toriyama has also contributed multiple character designs for various movie and video game characters, and was involved in the writing process for Dragon Ball Online, Yo! Son Goku and His Friends Return! !, Battle of Gods, Resurrection F, the continuation Dragon Ball Super in both anime and manga forms as well as Dragon Ball Super: Broly. Now has a Recap Page. Please contribute.